World politics changed in 1989. On November 9th, the Berlin Wall was opened, allowing citizens from East Germany to leave Berlin and taste life on the other side of the iron curtain. In the public imagination, this single event has come to symbolise the official end of the Cold War. As one wall came down, the triumph of capitalism was hailed, and the death of communism was proclaimed. In the words of Francis Fukuyama, history had ended. What no one could have predicted back then is that the end of the Cold War was going to be a lot more problematic for the West than expected, and especially for the United States. Perhaps in the euphoria of the moment we had all forgotten a little book published by the German philosopher and jurist Carl Schmitt in 1932. In The Concept of the Political, the author defends a definition of the political as the distinction between "friend" and "enemy": politics involves groups that face off as mutual enemies, and political entities are defined by this dichotomy. After 1989, without a recognised enemy, the West lost its political soul. For the last 30 years, the United States has desperately been searching for an enemy. A few came along, but they all left the scene far too quickly: Saddam Hussein, Osama bin Laden, Muammar Gaddafi. Vladimir Putin could be a strong contender for this opening, but he is seen more as a friend than an enemy in some circles in Washington. Kim Jong-un is desperate for an audition, but his performance is still not convincing. The frantic search for an enemy explains why the current president of the US wants to build another wall 30 years after the Berlin Wall came down. In 1961, the Eastern Bloc argued that the Berlin Wall was necessary to protect its population from fascism. Today, Donald Trump maintains that a wall is necessary to protect the US from rapists, criminals and drug dealers. Same logic, different lexicon. For the current president of the United States, there is an enemy - and it's lurking south of the border. But the collapse of the Berlin Wall was not the only politically relevant event of 1989. 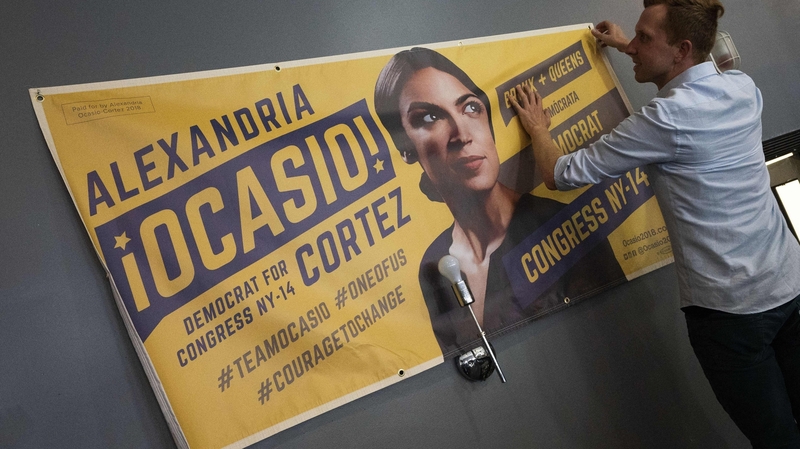 Four weeks before the Berlin Wall was breached, 5000 kilometres west of Berlin, Alexandria Ocasio-Cortez (better known by the initials AOC) was born in the Bronx in New York. Fast forward to 2018 and at the age of 29, democratic socialist AOC becomes the youngest woman ever to serve in the United States Congress, defeating 10-term incumbent Democratic congressman Joe Crowley, and Republican opponent Anthony Pappas along the way. AOC is a political phenomenon, and her 3.35 million followers on Twitter think she is phenomenal. 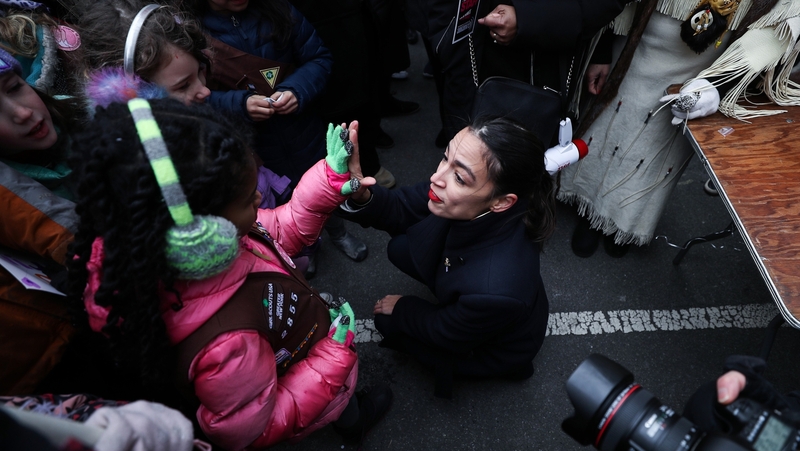 Her meteoric political rise defies all expectations and logic, and she is already been spoken of as a potential future president, although not for a while yet since the American constitution stipulates that one must be 35 years of age to meet the eligibility requirement. There's something about AOC. The media and social networks on both sides of the partisan divide cannot get enough of her. The blizzard of attention AOC has faced in the last six months is unprecedented. Everyone is trying to understand, and explain, what makes AOC special. Her friends think she is extremely accomplished, a ray of hope piercing through the dark clouds hovering over American politics since 2016. Her foes think she is exceptionally antagonistic, arguably the most serious threat to the establishment since Martin Luther King. What exactly makes AOC unique? Is it her age, which allows her to speak the same language as other millennials? Or her Puerto Rican heritage? Is it the fact that she is fearless, or as some would say, with cohones? Could it be her well-documented dancing skills, which at least one current European prime minister would die for? Is it her looks, or her smile, always framed by an irreverent bright red lipstick? Or perhaps her work-experience as a waitress in New York, working for tips and hourly wages? Or her humble experience outside of the United States, when as an undergraduate student in West Africa she helped midwives deliver babies in the Sahara, contracting malaria in the process? All of the above are part of the picture, but the AOC phenomenon is much more than the sum of its parts. For an adequate explanation of her undeniable political clout, and fast-growing influence, we need to look elsewhere, starting from her distinctive political philosophy, firmly grounded on a strong sense of social and economic justice. In the short few months since arriving in Washington D.C., AOC has fronted three major political battles. First, introducing a 70% marginal tax rate for the super-rich. Second, exposing how openly corrupt the current political system is, with every elected legislator, including the office of the president, susceptible to moneyed influence. Third, the urgency to do something about the pending disaster of climate change. There is nothing particularly radical about these three issues, but they share a common concern, which captures AOC's political philosophy. 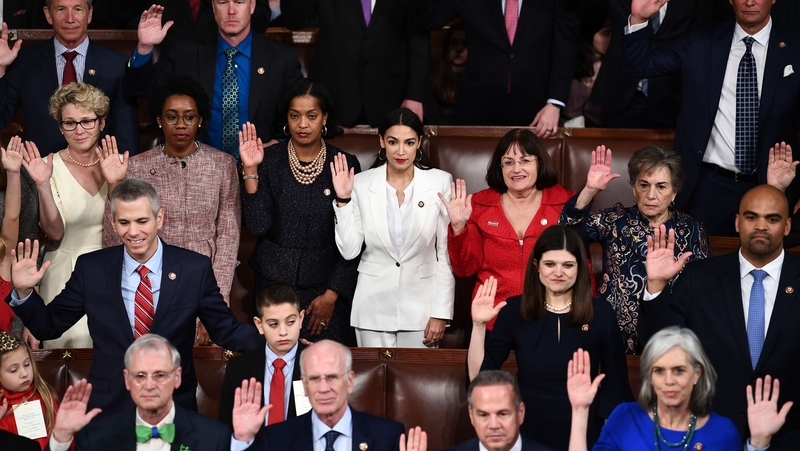 Although not referenced by AOC or her advisers, the theory of justice as complex equality put forward by the American philosopher Michael Walzer in his 1983 book Spheres of Justice can shed some light on AOC's political philosophy. Walzer, currently co-editor of Dissent magazine, argues that in a functioning democracy different goods belong to different distributive spheres. For example, there is the sphere of "money", "education", "health" and "politics". Each is a separate sphere, with its own criterion of distribution. Injustice occurs not simply, or necessarily, when there is inequality within a sphere, but more specifically when one sphere takes over another sphere. Thus, within the sphere of money, some level of inequality can be tolerated, since it is ok for some people to be richer than others, within limits. What justice cannot allow, and what must not be tolerated, is when the sphere of 'money' dominates the distribution of goods belonging to other spheres. But that is precisely what is happening today in the United States, and in all the other countries where neoliberalism reigns supreme and unchallenged. What AOC is telling us today, and what Walzer and many other political philosophers have been saying for a long time, is that the sphere of "money" has distorted the distribution of goods in the sphere of "politics". Money determines who gets elected, and what political representatives will do after they are elected. Money also has a disturbing impact on the criminal system, with rich people consistently getting more lenient sentences. In March this year, the former chairman of Donald Trump's campaign Paul Manafort was sentenced to just 47 months in jail for financial fraud, which prompted AOC to comment that it's almost impossible for rich people to go to jail for the same amount of time as someone who is of lower income (Manafort's sentence was later doubled). AOC's political philosophy, which I'm suggesting is essentially not dissimilar from that of Michael Walzer, is the core source and motivation behind her political project. But there is more. To be successful a politician needs more than a set of valid ideas; she must also be able to communicate these ideas. In the 1980s. British prime minister Margaret Thatcher showed us how this is done by way of her ruthlessly effective reductionism: no matter how complex or technical, every issue and policy came down to one very simple idea - the market before the State. The political message of Thatcherism was spectacularly simple, something the British voters clearly appreciated. Even though she operates at the opposite end of the ideological spectrum, it is the same with AOC. There is a very simple message at the root of AOC's political activism and rhetoric: gross inequality is a threat to democracy. This message may not be particularly original – contemporary moral and political philosophers have been saying this for decades, from Brian Barry to Susan Moller Okin, Joshua Cohen to Debra Satz, Martha Nussbaum to TM Scanlon, and before them Jean-Jacques Rousseau, Mary Wollstonecraft, Rosa Luxemburg and many others - but that's irrelevant. What matters is that AOC is endorsing this message, and this message clearly strikes a chord with many today who feel excluded from economic prosperity and political leverage. AOC is giving them a voice, and hope. AOC's direct style of communication, her simple but effective delivery, and forceful eloquence, is disarming. In a video on Instagram shot in her kitchen, she explains the logic of the Green New Deal while eating a snack: "if we do not act there is no hope; the only time we can hope is when we act". Political rhetoric doesn't get much better than this. AOC here compares favourably with the Roman philosopher Marcus Tullius Cicero (106-43 BC), the most accomplished master of eloquence and rhetoric in Western civilization, who once famously said "Where there's life, there's hope". Cicero would be impressed with AOC's affirmation on hope and action, and for sheer verve, he would probably also approve of AOC's next line: "But, when it comes to climate in particular, we're actually screwed". Finally, it is often said that AOC is a naturally-gifted public speaker, her style of political communication effortless. This type of praise is well-intended but misguided, and perhaps even unfair, since AOC's hard work is not always acknowledged or appreciated. Unlike the vast majority of politicians on Capitol Hill, she doesn't see her position in Congress as an entitlement, but always and only as a privilege, and she works extremely hard to repay her voters for their trust in her. This time it is AOC who would approve of Cicero's claim, from his book On Duties, that "the foundation of justice is trust". In terms of her work ethic, the term Stakhanovist comes to mind, but it is best not to use this idiom when referring to AOC lest some of her enemies should accuse her of Leninist tendencies. Perhaps Carl Schmitt was right when he said that the essence of the political boils down to the distinction between "friend" and "enemy". For Donald Trump, as for many other presidents before him, the enemy is always somewhere outside of the US, a foreigner, usually non-white, probably non-Christian. For AOC the real enemy resides within: it is the system that has allowed inequality to grow to unsustainable levels, the enemy is the unbridled, unregulated capitalism that defines neoliberalism, American-style. In 1989, when the Berlin Wall came down, there was plenty of economic inequality in America, but not to the obscene levels of today. In 1989 a CEO in the United States earned on average 50 times more than the average worker, which even then was a lot more compared to 1965 when CEOs earned only 20 times more than the average worker. According to a new study by the Economic Policy Institute, today's CEOs make about 312 times more money than the average worker. In 2017, CEOs for the 350 largest US companies earned an average pay of $18.9m, which was a 17% increase on 2016. In the same time, wages for the average US worker grew by 0.2%. This level of inequality is unsustainable. It contravenes our sense of justice, and it's damaging democratic procedures and practices. AOC understands that and wants to do something about it. 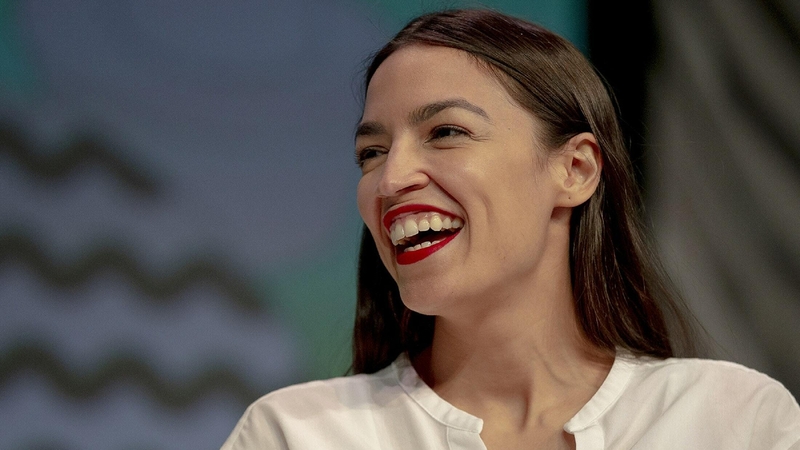 Had she been born a few decades earlier during the Cold War, AOC would probably not be working in Washington D.C. today. For as long as the Soviet Union was the enemy, socialism in America was off limits. But thankfully, that's no longer the case. The implosion of the Soviet Union is the best thing that could have happened to the socialist cause, and AOC is possibly the best thing that has happened to American politics. She is that rare political animal: popular but not a populist, authentic but not phoney, committed but never motivated by personal gain. Just like world politics everywhere, American politics is becoming increasingly polarised. The extremes are having more success, electorally speaking, than the moderate centre. The reason behind AOC's popularity today is, mutatis mutandis, the same reason that explains why Donald Trump is sitting in the White House today, and possibly will be until 2024. The next 10 years will determine the course of American politics for many years to come and AOC is set on a course to redefine American politics. But if her efforts are thwarted by her enemies, with their constant barrage of attempts at character-assassination, and she fails in her crusade to expose the injustice of structural inequality, and does not succeed to introduce progressive, egalitarian, non-corrupt, decent laws and policies, then social justice in America is as good as doomed. Or as AOC would say, we're actually screwed.